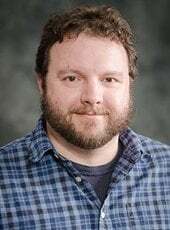 Josh Loar (VPA) has published the textbook “The Sound Design Primer,” through Routledge. At 586 pages, the textbook fills a need in the sound industry for a comprehensive text that is accessible for both a beginning audience as well as more advanced technicians. The textbook is also available through Kindle. 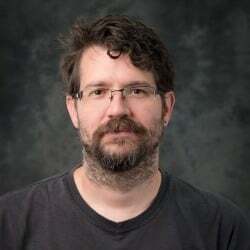 Green has helped with projects ranging from virtual reality titles to exploratory games, and has launched approximately six games. Green’s game ‘ABZÛ’ was nominated for a BAFTA (British Academy of Film and Television Arts) award and other awards. The game ‘What Remains Of Edith Finch’ is currently nominated for a few awards as well. Sound and Theatre students from the Visual and Performing Arts Department recently attended the Kennedy Center/American College Theater Festival (Region III) in Madison, Wisconsin. Started in 1969 by Roger L. Stevens, the Kennedy Center’s founding chairman, the Kennedy Center American College Theater Festival (KCACTF) is a national theater program involving 18,000 students from colleges and universities nationwide which has served as a catalyst in improving the quality of college theater in the United States. The KCACTF has grown into a network of more than 600 academic institutions throughout the country, where theater departments and student artists showcase their work and receive outside assessment by KCACTF respondents. Visual and Performing Arts students presented their work to a jury of professionals and received a number of awards. Top award winners in the design competition will travel to Washington, D.C. to compete in the national festival design competition. Mary Jennings (VPA, Rozsa Center for the Performing Arts) is the principal investigator on a project that has received a $15,000 public service grant from the Michigan Council for the Arts and Cultural Affairs. This is a 10-month project. 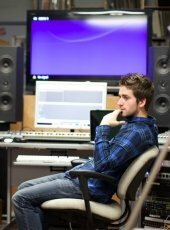 When I started studying audio production and technology, my ultimate goal was to become a Grammy Award-winning music producer. I thought I would need a cool stage name. I gave it some thought, but nothing clicked. Then one day “Smooth Smith” came to mind. It rolls off the tongue. I presented an audio file from my Soundcloud page and my professor and classmates could see the name: Smooth Smith. After that it just caught on. Audio production and technology is a very hands-on major. We learn everything that has to do with audio, theatre, film, and studio recording. After graduation, I have a job lined up with a show control programming company in Miami, Florida. I had a great co-op there last semester. During my time there, I worked on the Universal Holiday Parade for Universal Orlando—it was a huge learning experience for me. The most meaningful part of college so far has been the opportunities I’ve had through my jobs. I want to thank my supervisors and professors: I wouldn’t be where I am now if it weren’t for you. Michigan Tech has given me so much. I’m so glad I came here. I have a few jobs on campus now. I work for Athletics as a broadcast engineer, making sure our audio and video systems are working correctly during sporting events. I also work with Information Technology and as a coach in the Waino Wahtera Center for Student Success. Wahtera Center helps students who are looking to be more successful in school. I really love coaching! One of my most memorable experiences was returning from my co-op and being specifically requested by a student I had worked with the previous year. I was flattered to see how much they valued our sessions and the impact coaching had on their performance in school. My favorite part about being a coach is when a student reaches the point where they can come in for a session relaxed and with a smile because they are doing so well in their classes. The Visual and Performing Arts was in the news this past week for two different events. 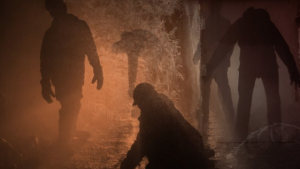 The Haunted Mine presented by the Department of Visual and Performing Arts was covered by WLUC TV6. Michigan Technological University VPA students installed 2,535 feet of speaker cable, 1,000 feet of microphone cable and 31 speakers to create the ultimate creepy soundscape for Quincy Mine’s annual haunted tour. A half-mile in and seven levels below ground, the 15-by-15 dark tunnel awaits the brave souls who dare to enter for pre-Halloween tours Thursday, Friday and Saturday, October 25-27. This is the second year Michigan Tech students in sound design and audio production and technology programs have collaborated on the project. 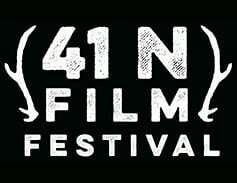 The upcoming 41 North Film Festival, beginning Thursday (Nov. 1) was covered by WJMN TV3. This year, the 41 North Film Festival will screen five films about history, issues and accomplishments related to STEM innovation in its lineup of more than 20 films. In an unusual turn of events, the University of Michigan Digital Music Ensemble (an experimental ensemble using electronic means to create sound art/concerts) is invited to perform in the Delaware Mine in Delaware, MI on October 7, 2018, which is located in the heart of the Keweenaw Peninsula. The ensemble will be presenting two concerts at the Delaware Mine, one at 6:00 and one at 7:30pm. Wine and Cheese reception above ground starting at 5:30pm. Space is limited to 40 people. The group will rehearse in a “virtual mine” during September, and will write music during the Music in the Mines – Masterclass in the Rozsa Center for the Performing Arts on Saturday, October 6, 2018 from 10:30am to 12:00pm and then perform the arrangement in the Delaware mine and in Ann Arbor – emulating the ambiance of the mine in sight, sound, and smell. 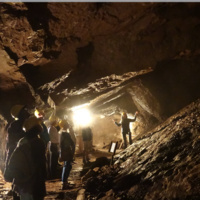 Director, Stephen Rush, Professor of Music, University of Michigan, has visited the mine already, doing an impulse response which means capturing the acoustical behavior of the performance space/Delaware mine digitally – for reproduction in the Rozsa and in Ann Arbor. This means that during classes/rehearsals at U-M will “sound” like the mine. The students will also be reading two books, The History of the Delaware Mines and Life of Douglas Houghton by Steve Lehto. In these books, they will learn three major things: the economic and geological history of Michigan, the importance of specifically copper mining to the United States and Michigan, and a new aspect on the history of the University of Michigan. As discussed above, new approaches to both physical and historical context in music making will be delivered through this project. Through the support materials the students will have an expanded understanding of local/Michigan history as well as institutional history (University of Michigan). This will be complemented by an exploration of Sonic appreciation of place, due to a new “angle” in the curriculum, a digital emulation of unique spaces. Every student will now be able to explore unique sonic spaces and emulate them digitally. The students, as part of this project, will travel to the Upper Peninsula, live in a Yurt for three days, perform in an underground Copper Mine and collaborate with Michigan Tech faculty, students, and the Keweenaw community. Equally, students will be interacting with geologists, and historians. They will also learn about digital emulation of unique sonic spaces and a vastly expanded appreciation for the history of the state of Michigan and the University which they attend. The technology used by the class to emulate the mine in rehearsal will quickly transfer to the entire PAT (Performing Arts and Technology) community. It is a unique if non-complicated, technology. It will allow all students to explore the sound of the spaces they experience more fully. Most students, down to the last one, have not even been in the Upper Peninsula and no student has performed in a mine before. They will also be living and cooking in the community for 4 days in a Yurt in a remote part of the Upper Peninsula. During the masterclass, new music will be created specifically in reaction to the performing space. No such classes have been offered at the School of Music in the University of Michigan, Ann Arbor that dealt with the creation of new music for the space. There certainly has been location performances (UMMA/the Arb, etc.) to address this issue. Only the Dance Department has really explored this genre deeply. Site-specific performances are an extremely important genre in the Arts, even a sub-genre/category for NEA grants, etc. and new faculty lines that feature this as a specialty. This is literacy and experiential learning combined. The concert in the Mine will recorded but the concert will be recreated in Ann Arbor with visual projections, the music that we performed in the mine (complete with digital emulation of the mine itself, as described above) and an attempt to create the musky smell of the mine. The Michigan Muse (the alumni magazine of the school that reaches 11k alums) is also writing an article about the project. In addition, the performance in Ann Arbor as well as at the mine will be shown/broadcast on YouTube. This academic year, we will be celebrating the 25th anniversary of the Visual and Performing Arts Department at Michigan Tech. We will hold a celebratory 25th Anniversary Gala beginning at 5:30 p.m. Saturday, Oct. 6, in the Rozsa Center for the Performing Arts. Celebrate with an evening of cocktails, dinner and live arts entertainment. 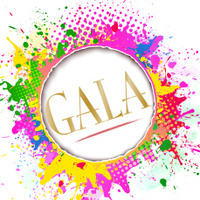 The VPA 25th Anniversary Gala will feature intimate performances in the lobby and on stage, and live auction supporting the Marian and John Irish Award for Environmental Art, the Visual and Performing Arts Department Theatre Scholarship Fund and the Rozsa Center’s Class Acts Program. Come dressed for celebration. There will be a cocktail hour (cash bar), full dinner, live music throughout the evening both in the lobby and on stage, an auction of unique arts experiences, artists working during the gala and more. Tickets for the evening are $75 per person. We will also be selling corporate tables (seating eight) for $1,000. Tickets can be purchased by calling the SDC Ticket Office at 7-2073 or following this link. More information can be found here. The Rozsa Wall Calendars are here. Pick one up at the Rozsa Center or at any of the more than 120 Houghton and Hancock businesses who display and distribute them each year. For Michigan Tech faculty and staff, we make it easy for you to get your copies of the calendar. If you would like a calendar delivered directly to your campus mailbox, fill out this form. We will gladly send a calendar to you in inter-campus mail. Featured this year are 12 Rozsa Presenting Series events, more than 33 Visual and Performing Arts events including music, theatre and visual arts events, and the ever-popular 41 North Film festival. 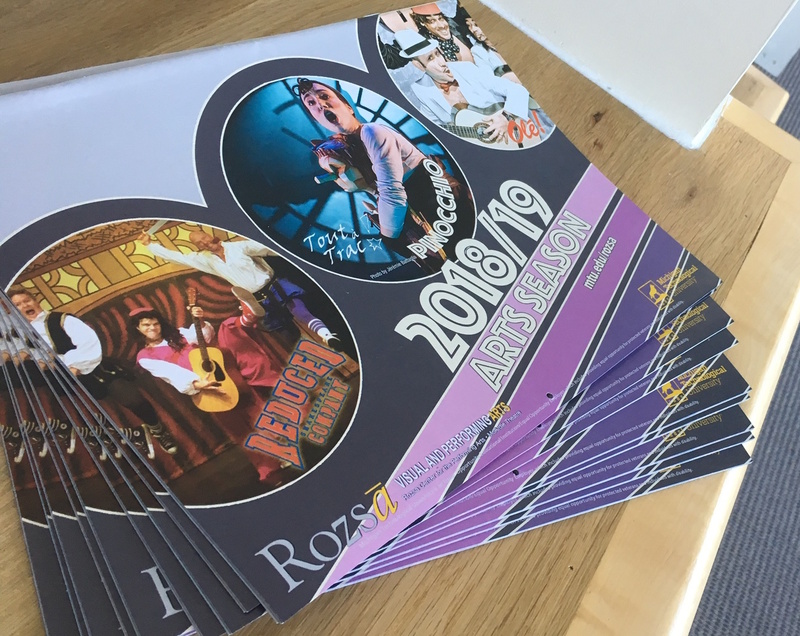 From comedy, to dance, to all-around spectacle, you will enjoy the variety and over-the-top fun of the 2018/19 Rozsa Visual and Performing Arts Season. Season Ticket Packages are on still on sale, offering savings of 18-37 percent. The popular “Pick 6” Season Ticket Package has returned and is an even better value this year. We brought back both a “Pick 3” option, and the very popular “Family Pack” option that will help you bring the whole family to a big show at an affordable price. We hope there is a package that works for you. Thank you to all of our long-time season ticket holders, we’re holding your seats. For new season ticket buyers, welcome, we look forward to seeing you this season. Not interested in a Season Ticket Package? Single-ticket sales began last month. For more information or to purchase tickets, contact Michigan Tech Ticketing Services at the Central Ticket Office (SDC), call 7-2073 or go online. The entertainment industry continues to increase its need for technologically advanced knowledge to realize complex scenic, lighting, and technical effects. Michigan Tech’s Visual and Performing Arts Department faculty know this. Kent Cyr attended an entertainment engineering conference over the summer. The conference was an opportunity to compare notes with other theatre technology educators and industry leaders about the skills needed to succeed in the entertainment technology field. It provided some much-needed discourse about the type of skillsets that are coming out of degree programs, along with a better understanding of how those skillsets can be utilized. They also discussed the educational requirements of colleges and universities in an effort to help the industry understand what to expect from new graduates. There were many take-aways from the conference for me… not the least of which was increasing my contact with the companies who hire our students. I am looking forward to the next conference and an opportunity to examine and refine the information and skills in which we train our majors. Cyr brings back knowledge to further VPA’s theatre and entertainment technology degree program. 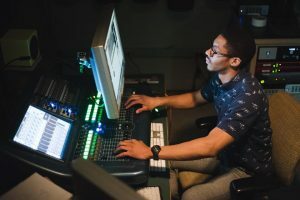 The BS in Theatre and Entertainment Technology pairs well with any of the following BS degrees: Mechanical Engineering, Electrical Engineering, Chemical Engineering, Computer Science, as well as the School of Technology applied engineering degrees.